In this article, we are going to solve a problem based on airline sit reservation with C++ implantation. The program should display the seat pattern, with an ‘X’ marking the seats already assigned. After displaying the seats available, the program prompts the seat desired, the user types in a seat, and then the display of available seats is updated. This continues until all seats are filled or until the user signals that the program should end. If the user types in a seat that is already assigned, the program should say that the seat is occupied and ask for another choice. The entire problem is discussed dividing into parts focusing on functional modularity. User is requested to input the desired seat no by giving corresponding no of seat. Like a valid seat no is 1A, 3C, 7D and so on, whereas, an invalid seat request can be 6F, 0B so on. The input is taken by our function getData() which takes user input & returns the string. Our major function for this problem is to check the validity of the seat request & update seat matrix status as per request. Firstly it checks whether the user input is in the range 1A to 7D or not. If user input is out of range a prompt out "invalid request" & continue for further request. Check whether user input is 'N' or not. If it's 'N' then user wants to end the program. Terminate. 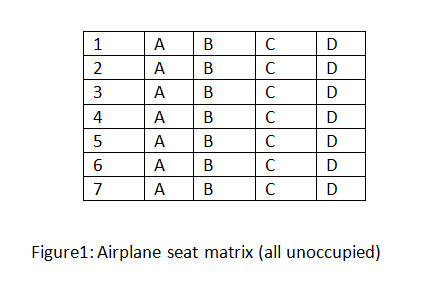 This checking can be done by founding the 2-D array row & column index for the corresponding seat. If the request is to update the valid seat we simple change its value to 'X'. It can be done by finding row & column index and updating the value of seat_matrix at that location to 'X'. The program also need to be terminated when all seats are occupied. Thus every time we keep a checking whether all the entry of seat_matrix is 'X' or not. //check whether sit is already occupied or not. enter N if you are done!